In Egypt, a billboard reads "a veil to protect or eyes will molest"
Please see this article by Egyptian journalist Mona Eltahawy. I’m including an excerpt, but the entire piece is worth your attention. I thank her for her honesty – it’s voices like hers that will one day break the shackles of shame. 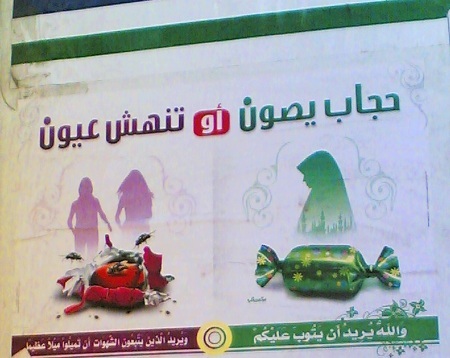 “When did Egyptian women become candy and when did Egyptian men turn into flies? There is no law criminalizing sexual harassment in Egypt, and police often refuse to report women’s complaints. And when it is the police themselves who are harassing women, then clearly women’s safety is far from a priority in Egypt. The State itself taught Egyptians a most spectacular lesson in institutionalized patriarchy when security forces and government-hired thugs sexually assaulted demonstrators, especially women, during an anti-regime protest in 2005, giving a green light to harassers. So there was little surprise that during a religious festival in 2006, a mob of men went on a rampage in downtown Cairo, sexually assaulting any woman they came across as police watched and did nothing. It was only when bloggers broke the news that the media reported the assaults. Still, the Egyptian regime has never acknowledged it happened. At a demonstration against sexual harassment that I attended in Cairo a few days later, there were nearly more riot police than protestors. My sister Nora was 20 at the time, and she, with several of her friends, joined the protest. She had never been to a demonstration before but was incensed when she heard the State was denying something that had happened to her many times. We swapped our sexual harassment stories like veterans comparing war wounds, and we unraveled a taboo which shelters the real criminals of sexual harassment and has kept us hiding in shame. The full article can be read by clicking here, and you can see Ms. Eltahawy’s blog here. Next Post More. About. Hijab. Swanky hijab this time. I’m not a fan of Egypt for that specific reason. I went there once, for one day, when I was 15, and sure did have the time to be sexually harassed in that time at a museum… But then I recently read that 98% of western women visiting Egypt are sexually harassed. Lovely.